The Club gets tickets for England Home internationals at Twickenham, and also for England away 6 Nations games. 1. Tickets are subject to availability with no guarantee. 2. Payment for tickets must be made by the date requested. 3. The Club's Board of Directors (the Executive Committee) emphasises to members one particular aspect of the ‘terms’ of receipt of international tickets (allocated by the RFU to the Club). Members must ensure that tickets bought via the Club and given to them are not given/sold to anyone they do not know/trust - say if someone is not able to attend a game. If a member no longer needs ticket(s) bought via the Club or has any doubt, he/she must contact the Club International Ticket Secretary and he will arrange for the tickets to be re-allocated to another Club member . This aspect is emphasised in the light of the incident that occurred a few years ago. Someone sold Club tickets to a tout who was ‘picked up’ by the police, who in turn informed the RFU. 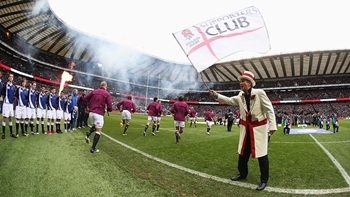 The RFU reduced the Club’s ticket allocation for the next year, with a warning. If another incident were to occur the Club’s allocation will be reduced again – possibly to zero. Any member or a member’s guest who sells international tickets to third parties or tickets touts will be subject to Club disciplinary procedures. Members will need to confirm in writing or by e-mail to the Club International Ticket Secretary that they will adhere to this condition and that they have read both the RFU Twickenham Ground Rules and The RFU Tickets Terms and Conditions before they are given their tickets. 4. To be eligible to apply for international tickets you MUST be a current and paid up member of the Club. Please note that a £1 admin fee will be applied per ticket. 5. Regarding payment, normally members pay the Club and then the RFU direct debits the Club. However, if and when additional tickets (to the normal allocation by the RFU to the Club) become available, the International Ticket Secretary has to go on-line to acquire and has to pay straight away. In this circumstance, members wanting tickets may be asked to provide debit/credit card details to pay for tickets, and thus must be contactable on the day when the Club's International Ticket Secretary goes on-line to try and obtain tickets in case he needs to contact you; such members will be advised of this by e-mail. Members that require more information/have queries should contact the Club International Ticket Secretary Peter Hannan - peter.hannan1@ntlworld.com .